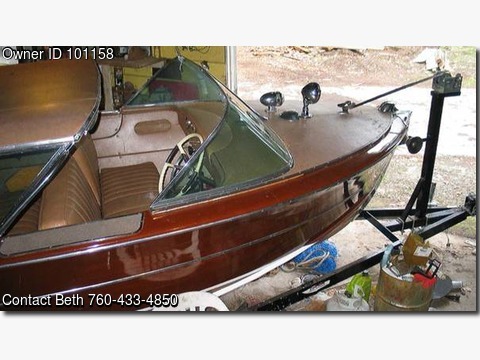 Boat is located in Dunsmuir,California.Please contact the owner @ 760-433-4850...For Sale: 1958 Century Coronado "Zippy" classic wooden boat. Designed as a runabout on protected waterways, this classic wooden boat requires no additional work and is being stored on its trailer in a covered building in Dunsmuir, CA. It is 20'8" long with an 8' beam and 1'10" draft. It has an upgraded MerCruiser 7.5 , 350 rotation engine. The fiberglass overhead cockpit is located on the starboard side and is retractable over the forward bench seat. It is on a Trail-Rite tandem axle steel frame trailer. Interested buyers can ask questions, arrange to see the boat and view the complete appraisal report completed on March 3rd, 2016 by replying with your name and email address. Your address will be added to the dropbox giving you access to the full appraisal report and pictures. Appraised value $33,640 for boat and $1200 for trailer total $34,840 or best offer for quick sale. Your dream of flying over the blue water in a James-Bond-worthy classic boat is about to come true!